Preheat oven to 375° F and grease 9 x 13-inch jelly-roll pan. Combine flour, baking soda and salt in small bowl. Beat butter, granulated sugar, brown sugar and vanilla extract in large mixer bowl until creamy. Add eggs, one at a time, beating well after each addition. Gradually beat in flour mixture. Stir in chocolate morsels. Spread half of cookie dough into prepared pan and bake for 8 to 10 min. Remove pan from oven and set aside. Meanwhile, in a double boiler (or a heatproof bowl set over a saucepan of boiling water) melt caramels with ½ cup evaporated milk. 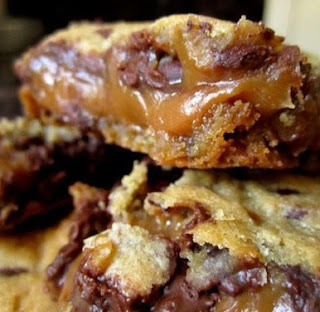 When melted and combined, add ½ cup melted peanut butter and pour over cookie base. Sprinkle chocolate chips as evenly as you can over the caramel.